Recently we looked at Benidorm, and the top 10 FREE activities there – great ways to save a few cents, especially if you’re travelling with a family – every little helps as they say. One of those things to do was to visit the great beaches of the area. it’s not called the white coast for nothing. We looked at two beaches close to Benidorm itself, but there are of course lots more to choose from. 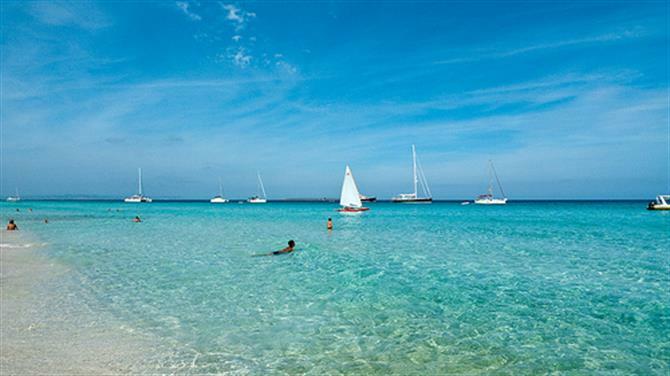 Let’s look at the top tanning spots – the top 5 beaches of the Costa Blanca. The Perfect Plan – of Inaction. Wonderful as it is to explore a new destination, sometimes all you need from a holiday is a total wind down. A well stocked Kindle or that paperback you keep meaning to start, a decent sun cream, and a soft towel. A week of horizontal healing, as you top up the tan and feel the rays of Spanish sun melt away your worries and stress. Sound like a good plan? Before you reach for your hand luggage, let’s see where’s the best place to go. Spain has miles and miles of coastline to choose from – but millions of visitors every year can’t all be wrong. Flock with them to the white coast, soak up some sun, relax and discover some, or all, of the top 5 beaches on the Costa Blanca. What’s in a name? Well, El Paradis says it all then! Choose your spot on the 1km of fine golden sand. Well equipped too with facilities such as lifeguards, loos, play areas, beach-side bars and restaurants if you’re feeling peckish. A great beach for families – it has the coveted Blue Flag – this is one to visit with the kids. Where is it? 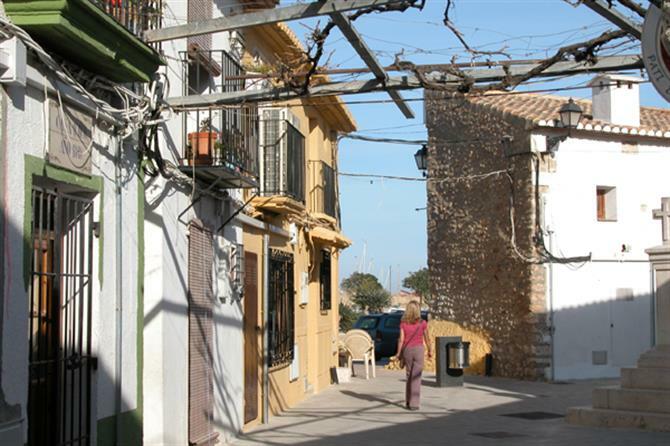 Villajoyosa lies just 32 kilometres from Alicante. You can get off the plane and be there in an hour – what a great first day to your holiday. Worth mentioning also is Playa La Caleta in the same area. Clean and clear waters, and plenty of opportunity for trying out some water-sports here too – it’s the home of the local Club Nautico. Villajoyosa is famous for the manufacture of chocolate, no wonder the name translates as ‘Joyful Village’! An apartment to rent in Villajoyosa. This one comes up in the nominations time and time again. 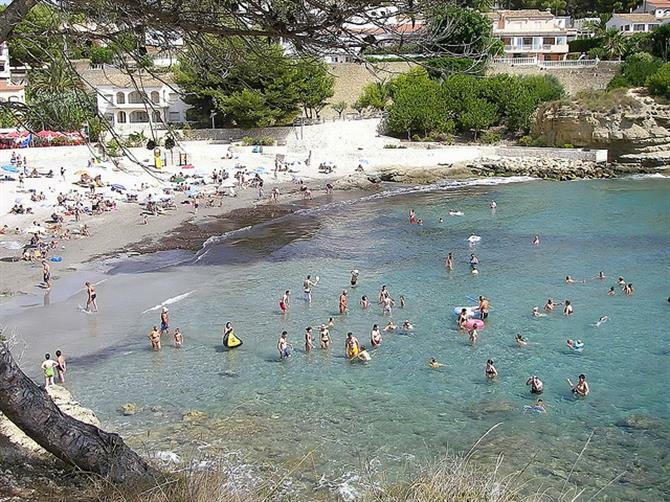 Jávea itself is a popular spot with holiday makers, and it’s really not surprising at all. La Granadella is a perfectly shaped horseshoe of pebble, but don’t let that put you off. It’s very fine, and behind the beach sits a forest of Aleppo Pine trees, so you can sleep surrounded by the twin scents of salted sea air, and fresh pine….add to this dreamlike scene the gentle lapping of the waves, and you’re hooked like a baited fish. Where is it? Jávea has superb road connections to both Alicante and Valencia and is quite charming, made up of the Old Town, the port and of course the stunning sandy beaches – an ideal holiday spot. Picture rocks and golden sand, an afternoon peering into rock pools with the kids, excellent scuba diving, and private coves. Want it all in the same place? No problem, just get down to Dénia on the Costa Blanca, and head for Les Rotes where it all awaits. Forgotten your bikini or even your mankini (er, probably best)? There’s even a nudist area too, so again, no problem. Where is it? Right between Alicante and Valencia, Dénia is well situated. There’s a castle amongst other areas to explore when you get tired of bucket and spade life. 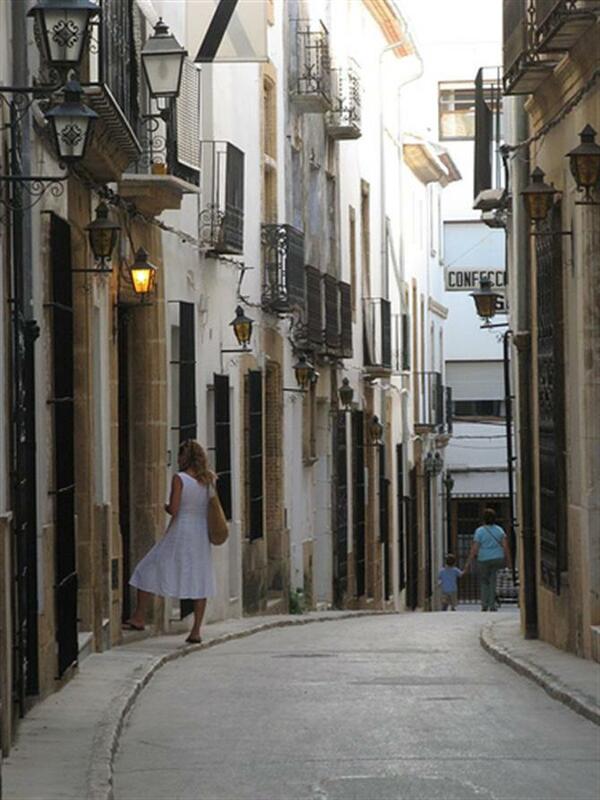 You can even venture further afield and take a trip to Ibiza, if you fancy island life for a day. Lovely places to stay in Dénia. Situated to the North of Alicante, you can even take the tram to the beach of San Juan, where you’ll find 8 kms of golden, fine, soft sand. Disabled access, lifeguards, toilet facilities, bars, restaurants and even a Blue Flag too. Like beach life but he gets bored? Pack him off to the nearby 18 hole golf course – sometimes being a golf widow can be really rewarding! Pass me that sun cream…. Where is it? To the north of the city, drive, take the tram, you could even catch the bus. A beach accessible to all. Like a party with an atmosphere? 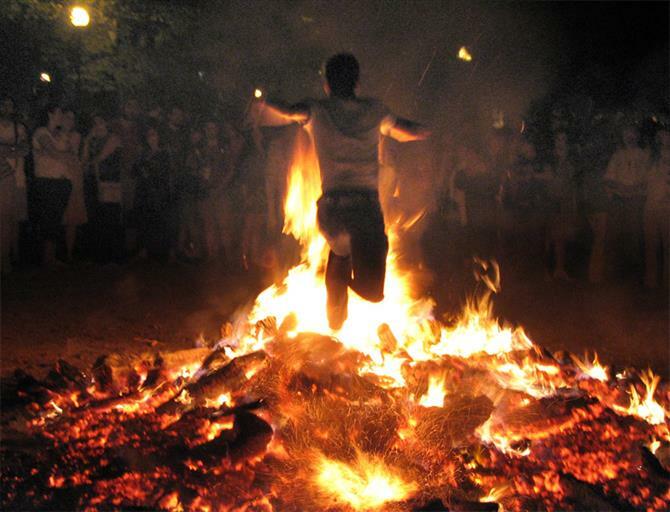 Then pitch up here for San Juan, the beach celebrations at midsummer, where you can join in with bonfire jumping and ritual cleansing – if you want! Holiday rentals in San Juan. Gently sloping, safe, clear waters – a parent’s dream. Your little ones will be safe and sound here, with soft golden sand thrown into the bargain. Popular with Spanish families too, take a picnic and spend all day here, bring plenty of parasols for shade. Lots of shacks selling ice cream and treats – keep up that bottled water intake – and bars for a coffee or a plate of food if you haven’t brought the kitchen sink. Bring your binoculars too – not for the design ated nudist area, but for spotted birds of the feathered variety, this beach is surrounded by salt pans and wetlands, great territory for waders.Where is it? Santa Pola is between El Altet and La Marina, south of Alicante. In fact 15 kilometres of beaches dot the coastline hereabouts, you’ll be totally spoilt for choice – explore them all!A place to stay in Santa Pola? Plenty of rentals here to choose from.Just 5? No, way more await – that’s just a small sample of some of the best beaches long the Costa Blanca – hey, what’s your favourite? 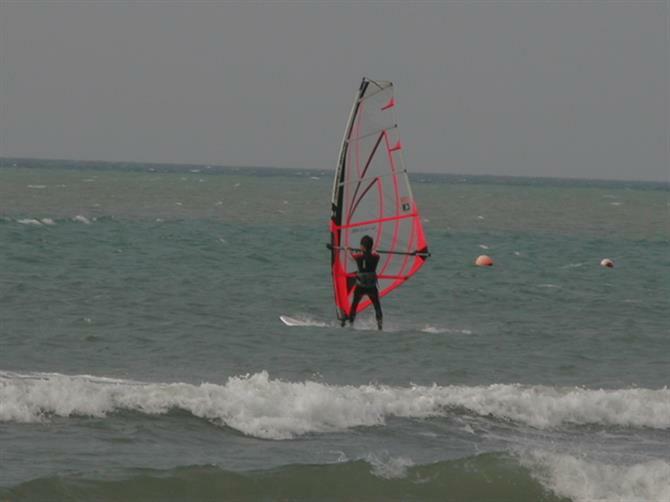 This entry was posted in Alicante, Beach wear, Benidorm, Children, General information by neville. Bookmark the permalink.